(Sept 2009) One clever salsero put together a flash application called the "Salsa Beat Machine" which you can play with to understand how the different instruments contribute to the basic salsa rhythm, as we do below. If you'd like to try it out, visit the machine I saved by clicking HERE-SALSA BEAT MACHINE. Also, if you go to the HOME page of that site too, you'll see videos uploaded there by the creator that show graph(oscilloscope) of songs with the "1" notated visually and by a speaker. Nice.. There is a pretty in-depth discussion of the CLAVE on Wikipedia too: Clave<-Check it out! 1,2,3,4 | 1,2,3,4 | 1,2,3,4 | 1,2,3,4 | 1,2,3,4 | etc. The vertical bars just represent the musical bar boundaries. All numbers above are separated by an equal amount of time = 1 clock tick. Please refer to my “Rhythm Cheat Sheet” to see this visually. Download from this site. 1,2,3,4,5,6,7,8 | 1,2,3,4,5,6,7,8 | etc. 1,2,3,and,5,6,7,and | 1,2,3,and,5,6,7,and | etc. In musical terms, we don’t take a step on the 4th beat of every measure, or beats 4 and 8 of the dancer count. But it is a good idea to say something on those beats (“and” in this case” so that you count evenly like a metronome or clock! In the S.F. Bay Area, most teachers started teaching with the “six-count” since there are only 6 steps in the basic over the 8 beats. This had advantages, especially when teaching beginners and it is also shown on the Rhythm Cheat Sheet. But today, almost all teachers world wide count in 8 and hence it is more conventional and uniform to do so. So, that is the basic rhythm that will affect everything that you learn in dancing. In advanced dancing, where dancers do “open work” or dance alone to the music, some dancers will dance on beats other than the basic step beats. 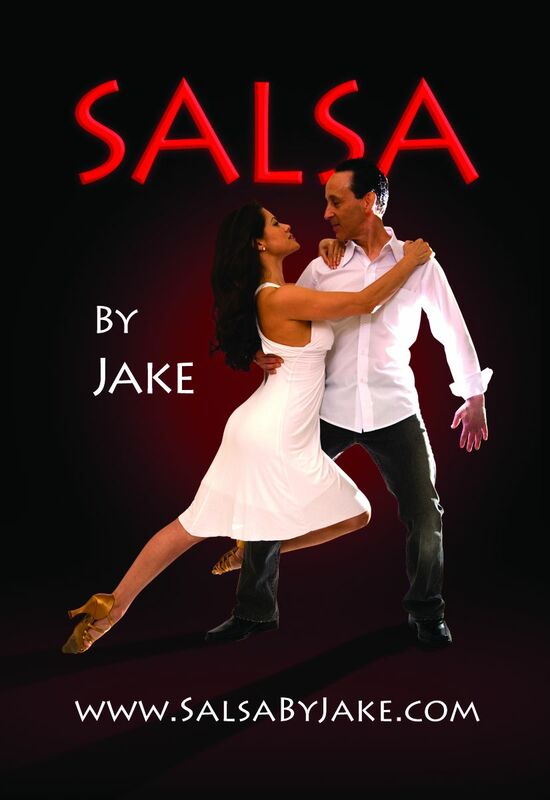 As long as it is musical, it works, but as you first learn salsa, it is best to stick to the basic beats! Some of you have heard of the “clave” already for certain. All Latin music is based on this ancient rhythm. The African clave is actually in 6 beats rather than 8 beats. This is why in some Salsa songs, the rhythm changes to a “6/8” measure to quote this African rhythm. But mainly, the music stays in 4/4 time and it is based on an 8-beat version of the clave. The clave, being a 2-measure rhythm, make it another good reason to count over two measures as dancers too. To make matters even more confusing, the phrasing of the music often changes DURING the same song. So, the clave sense will change from 2-3 to 3-2 and visa-versa during a song. NOTE that the clave itself never changes from start to end of any song. It is just the phrasing of the music that changes! Any section of music that has an odd number of measures will cause the clave (2-3 to 3-2 or opposite) to switch. As dancers, we don’t always conform to a particular clave, but this is a matter of debate. Some dancers are pedantic about dancing ‘on clave’ and will start their step with the 2 side of the clave. When the song changes clave, some dancers stop and start again to stay always such that their count “1” is on the first measure of the clave in that section of the song. But it is very rare that you will meet dancers that consider this when they dance. And if the dancers are experienced, they can make the switch so that it is not very noticeable so you may not even realize it is happening unless you’re intimate with the music. A salsa band often has 3 percussionists. 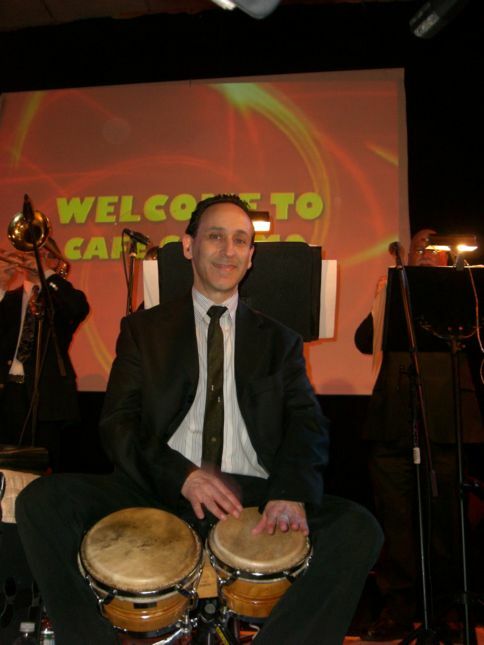 In some music called “Conjunto style” there are only 2 percussionists. The 3 players play different rhythms that fit together to form the overall complex rhythm, which is why many people that don’t grow up with salsa music have trouble hearing the beat through all of this activity. In a jazz band for example, the rhythm section is normally just bass and drums. The 3 percussionists play 1) Conga, 2) Bongo/Bell, 3) Timbale. Additionally there is almost always a piano and bass present forming the rest of the basic rhythm section. Beyond those players, there is usually a group of horn players and singers. Sometimes a flute is present and in some music called Charanga, a violin is present. In some music there is a marimba as well, and/or a Tres –which is similar to a guitar. 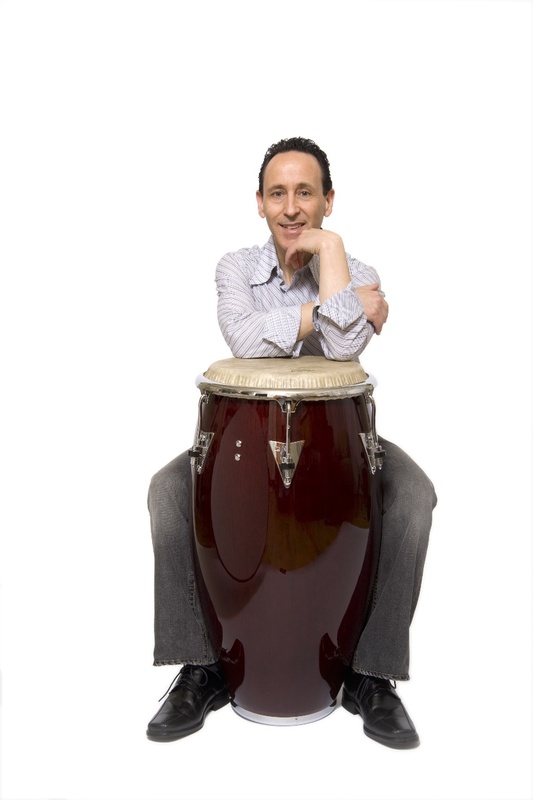 Often the singers will play small percussion instruments too in order to fill out the rhythms. These include Guiro (“scratcher”), Maracas, and blocks of wood called Claves which are used to play the Clave directly! Rhythm instruments typically play a “basic” too – in other words, they play a basic rhythm as their part when the music is steady. In songs, there are often “breaks” which are extra rhythmic passages and of course each player will embellish their playing with other variations as they play. The basic rhythm is called “Tumbao” or sometimes “Marche” – like marching together in an army formation. The “slap” that the conga player hits on beat 2 is loud and identifiable and dancers that dance on-2 will use that to sync up. But it can be very confusing to people trying to find “1” in the overall count! The bongo player in the band plays drum during the verses or “down” sections of the music. The basic marche rhythm for bongo is only 1 measure long and it is basically 1-and-2-and-3-and-4-and, or every ½ beat. The sound played on 4 of the beat is on the lower of the two drums in the bongo and hence a lower sound. When the music energy picks up, the bongo player in turn picks up his bell or campana and plays to keep a basic time for the band. The open sound – when he hits near the mouth of the bell – comes on beats 1 and 3 of every measure and is often referred to as the pulse. If you dance on-1 and you break on the open sound of the bell, then you’ll be breaking on the beat 1 or beat 3 of each measure. Many dancers cannot hear the difference, and you’ll often see dancers dancing on either of those two beats in a salsa club. SAMPLE: BELL AND GUIRO medium with counting. 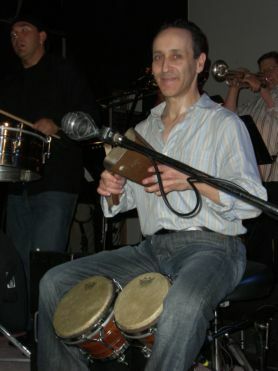 The third main percussion player in a salsa band plays the closest thing resembling drums in non-Latin music. Two metal drums are mounted on a stand along with bells and one or two cymbals. The timbale player also switches roles during a song, playing the sides of the drums (called the shells) a rhythm called “cascara” during the lower energy portions of the song (when the Bongo player plays his drum) and then moving up to the bell and cymbal during the high-energy portion. These rhythms are a bit more complex and there is no sample of them in this tutorial, but they are described in Rebecca’s book on basic salsa rhythms. Putting these all together forms the complex rhythms of a salsa song. Beyond that, the song structure is often very much like any pop song with one or two verses, followed by a chorus section. In salsa, the chorus section is called the “mambo section” and it is the higher energy portion where the bells are played. It is also the easiest to hear the beats, which can be unfortunate since most songs do not start with a mambo section! Singers sing the versus and during the chorus section, they engage in “coro/pregon” where a chorus is sung and then a lead singer often improvises during sections between the chorus to tell a story. It is the same structure of “call and response” that makes up such a large portion of this type of music, dating back to the ancient African rhythms themselves such as Clave, which were the way tribes communicated from a distance – with calls and responses. The horns play melodies too like in pop music and often play a repeating phrase called a “mona” during the mambo section of the song. All together you have a salsa song. I hope this has helped explained the complexities of salsa music to you as you begin your journey into Latin music and dance. The music is rich and varied and dates back to sounds from hundreds of years ago, which may be why it affects people so deeply. To be a good dancer, you HAVE to relate to the music since the music inspires the dance and rhythms in the music are also inspired by dance too. But most importantly is to express the music when dancing and to have good musicality. Dancers that simply do a series of moves, however complex, look mechanical and do not represent the music well. So, listen, listen, listen and become familiar with what you hear. It will make your dancing experience tremendously more enjoyable! THEN PLEASE CONTACT JAKE THROUGH THIS WEB SITE! I can configure a great band for you of almost any size, and help with your entertainment! Why should you learn more about the music you dance to? The music IS the dance and the dance is the music. They are both inspired from each other and of course work in unison (if you dance on time!). Many people can dance well just hearing the basic time or beats of the music. Others struggle to hear it at all. By understanding more about the construction of the music, it will sharpen your skills at picking out the beats and the clave no matter who you are. And when you understand the music being played more, you'll better appreciate the efforts that go into making it, and the musicians that perform. Also, while "musicality" is a popular term recently in salsa dance, and people like to accent the breaks in the music, they can normally only do this in songs they've heard over and over again. If you understand the music and listen to a lot of it, you can actually predict the form of the music just as the musicians do when they sit in with a band they've never played with previously. Now that's cool!